Home > Uncategorized	> Okay, which is it? The facts or the facts? Carbon-14 counted AD 13 centuries. The slo-mo of the baseball game was the ‘the facts’. The opinions of the ‘experts’ differed, and so it was up to Dan to assess for himself who should have won. He could have used the past history of the teams, or the players, or calculated the speed of the moving parts, the resolution of the film, analysis of the sound and so on, and in the end he might have decided for himself – I can’t tell. Actually it seems he was mostly moved by which team he happened to support when he reviewed the evidence. I don’t know if any baseball pundits actually did go into that detail there, but a somewhat similar case is whether Neil Armstrong said “One small step for A man” or “One small step for man” omitting the “A”. “The facts” is the video which anyone can see, and the occasion certainly has been scientifically analysed to the nth degree. Experts remain conflicted, so we can decide for ourselves: yes, no, or, a most important but frequently neglected alternative, I don’t know. There are few facts about the Shroud in the quotations above. The first is mostly a series of questions. Questions are not facts, although they are often used in Shroud studies as if they were. “How could an artist have done it?” is often used as evidence for authenticity, and “Why are there no actual wounds?” is used above as evidence for inauthenticity. The second is mostly assertion. Assertions are not facts either, although they are often used in Shroud studies as if they were. “It is certainly the funeral fabric that wrapped a tortured man” is used above as evidence (!) for authenticity. It is always important in Shroud studies to get past the rhetorical questions and conclusive assertions to the primary evidence behind them. Experts, even baseball experts, are not experts because of what they say, but because they can explain what they say using their experience and collaborative evidence. (*) Joe Friday (Dragnet) never used this expression….. 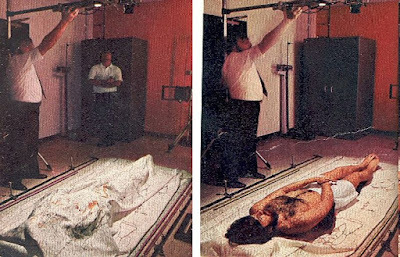 Most people assume that Jesus would have been wrapped in the Shroud in a manner as shown in Dan’s accompanying picture. But since the women were supposedly coming back to the tomb on Sunday morning to anoint the body, I would think it’s very possible that Jesus could have been just laid on 1/2 of the shroud with the other half then pulled over but without any tucking/binding. In the unlikely event of anybody using a long thin sheet to cover a dead body, I think Joe is quite right in that the body could have been laid on one half, and the other half laid back on top but not tucked or tied pending the arrival of further anointing on the first day of the week. However, the body would certainly not have been lain with the feet at the end, such that the head was covered before the feet. It would have been laid with the head at the end, so that the last thing to be covered would have been the head. But Joe is certainly also correct that even if body was laid with the head at the end, God could arrange the image so that it shows the head in the middle. God is not constrained. After rigor mortis , bilirubin , under the skin x-ray images , computer hacking , invisible reweave , masonic conspiracy, neutron radiation, to name just a few , we now have Jesus being laid on just half of the shroud. Until someone can definitely figure out how the image is natural or man-made, a putative God can put an image on a cloth anyway it wants, with whatever characteristics it wants. It should be noted that while pro-authenticity views can’t all be simultaneously be true, neither can all the anti-authenticity views. True experts on Shroud image have long ago infered how the body of the man of the Shroud was covered by the burial cloth. Joe Marino made a great point. The women saw everything. Joseph and Nicodemus were in a hurry to finish before 6pm knowing the women were planning to anoint the body. I believe the cloth did collapse because of the bloodstain off the right elbow (see Gilbert Lavoie’s work on that). It even has a brown hue instead of crimson as does the bloodstain where body image exists on the arm and elsewhere. Curious. I realize Dr Jackson believes the cloth was bound around the body but Joe’s point combined with a collapsing cloth greatly reduces the wrinkling distortions. This seems to be a very elegant explanation. Who knows? Maybe the Lord gave them detailed instructions on how to do it yet still comply with Jewish burial custom. In any event, as mentioned above, God made this image for a reason. Sign of Jonah. We agree: the previous image of the wrapping is impossible, although enigmatically repeated in many sindonist papers. But it is also full of wrinkles and distortions! But even in this unnatural scenario there are still some wrinkles and deformations due to the natural weight of the fabric. You have not solved the problem of deformation. Only some unnecessary ad hoc hypotheses were added. And new problems are waiting. What about Zugibe, for example? A few days ago, an Israeli, privately funded space probe Beresheet https://en.wikipedia.org/wiki/Beresheet crashed on the Moon due to the engine failure. I have several encyclopedias from communist era in my house, and they are not as much biased as the articles about the Shroud in English Wikipedia. Had the Israeli probe not crashed on the Moon, they would stay there for millions of years, as a testimony of our civilization and our understanding of the Shroud of Turin for any future intelligent lifeforms, capable of retrieving these data! It is an absolute scandal that although english Wikipedia has several good articles on scientific topic, the Shroud articles are just blatant propaganda, in the worst style of authoritarian regimes. And any attempt to change that are blocked by the gang of Internet treolls that control these articles.